United States military denies report that airstrikes killed 52 civilians in northern Syria, says those killed were actually fighters. The United States military on Sunday night denied a report that airstrikes led by Washington had killed at least 52 civilians in northern Syria earlier this week, saying those killed were actually fighters. Syrian Observatory for Human Rights monitor director Rami Abdel Rahman had told AFP that seven children were among the dead from U.S.-led coalition strikes overnight Thursday into Friday on the village of Birmahle in Aleppo province. He had warned the toll could rise as rescuers were battling to save 13 people trapped under rubble. In response a spokesman for the United States Central Command confirmed in a statement that "Coalition forces conducted airstrikes in the vicinity of Birmahle, Syria, on April 30, destroying several [ISIS] fighting positions and striking more than 50 [ISIS] fighters." "We currently have no indication that any civilians were killed in these strikes," added the spokesman, Major Curt Kellogg. 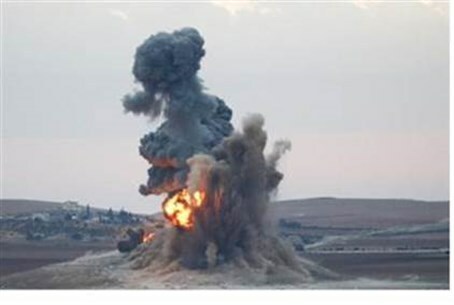 Kurdish militiamen and Syrian rebel fighters were clashing with ISIS fighters in a town roughly one mile (two kilometers) away from Birmahle at the time of the strikes. "Prior to the airstrikes, Kurdish forces, who held the town before leaving after being attacked by ISIL, reported there were no civilians present in that location and that there had not been any civilians present for two weeks prior to the Coalition airstrikes," Kellogg said, according to AFP. "We have significant mitigation measures in place within the targeting process and during the conduct of operations to reduce the potential risks of collateral damage and civilian casualties,” he added. "We work extremely hard to be precise in the application of our airstrikes and take all allegations of civilian casualties very seriously." Abdel Rahman had indicated that the village is inhabited by civilians only with no ISIS presence. Airstrikes by the international coalition have supported Kurdish militias fighting ISIS in Aleppo province, most notably in the flashpoint border town of Kobane, which is near Birmahle. Backed by the strikes, Kurdish fighters drove ISIS fighters out of Kobane in January.